Attention Commander! You’ve been called to lead an army through war, guiding them to victory against waves of enemy forces. 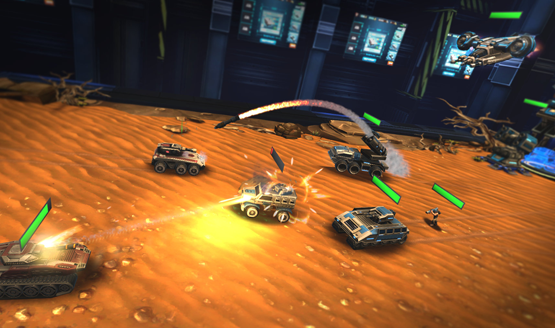 The tabletop is your battlefield, and you’ll be sending out troops to defeat rival commanders that stand in your way. The pitch for League of War: VR Arena is a novel one. Take a real-time strategy style and make it lite. 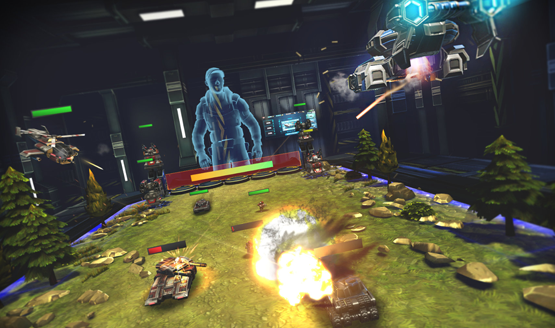 Virtual reality has set the stage for potential new ways to experience RTS games, but League of War strips out so many of the RTS elements that it can barely be called a game. League of War starts out without any kind of tutorial, tossing me straight into the deep end where I crack my head on the bottom of the pool, because the experience is actually pretty shallow. Standing at one end of a table that represents a battlefield, I use the Move controllers to grab one of up to five available units and place them on the board. They run forward. They attack whatever’s in front of them. Sometimes they die. When a new unit is ready, I grab that one, send it out, and hope that it’s enough to overwhelm my opponent and destroy the four towers on their side of the table. There are hints that a deeper game is here somewhere. Spawns of troopers are based on diffused energy, so respawning a single unit is much faster than if you have all five cooking at once. Holding the trigger on a unit allows you to focus all energy into spawning that one, but stops the timers on the others. Differing stats of various units and the way you can aim your troops where you want them to attack give telltale signs that this game is meant to have some kind strategy system behind it. But just as quickly as the strategy seems to shine through, it is snuffed out. Classes of troopers seem random. One spawn might be a low level grunt infantry, and the next might be some badass with a rocket launcher. As far as I could tell, there was no way to force the spawn that I wanted, like if I just wanted to spam the field with faster spawning, but weaker troops. If there was, the game never let me know about it, so it’s bad design either way. Calling this a strategy game doesn’t quite cut it. With no control over your troops after sending them onto the field, they target their initial goal and then decide what else to do themselves. League of War isn’t an RTS-lite game. It’s the troop spawning portion of an RTS game turned into a full experience (and I say experience lightly). As I spawned a unit—whether it be infantry, a tank, or a helicopter—I could send it at a specific target. After that, it’s anyone’s guess what it will do, and sometimes it didn’t even go after the target I aimed it for in the first place. What this resulted in was me simply spamming the field with various units in hopes of taking down whatever the enemy was throwing at me. There’s a very mild rock-paper-scissors type mechanic, where some units are good against one type, but severely weak against another. As long as I was even halfway paying attention–making sure I had surface-to-air units to take out the helicopters, for example–there was very little effort or though that I had to give to the gameplay. I was simply twitching my hands a few inches, grabbing the units as they became available, and tossing them onto the battlefield. Certain opponents required a very light strategy of thought, but once I figured out their exploits, it was easy to overwhelm them and take them down. One may require simply spamming helicopters, while another may need tanks to go in as a distraction while artillery rains hellfire from behind the front lines. The game was very simple until it wasn’t, and then it was brutishly difficult. There was no in-between, and losing always felt like the AI was cheap and unfair. Nine commanders grace the campaign, each with eight opponents (the other eight commanders). Gameplay never changes and there is never a sense of advancement. The shallow gameplay of sending out troops simply goes from far too easy and dull to intensely frustrating because the enemy often just has better or stronger units. That’s not even to mention how they seem to be able to spawn them at a much faster rate than should be possible. Strategy never felt like the answer, unless you consider gaming the system and spamming troops to be a strategy. The campaign has a loose story that’s told in brief monologues for each commander as you advance through their battles, but they amount to little more than banter of how much better they are than the other commanders. I guess that’s the kind of depth you get from a bunch of hired guns. More often than not, I ended up skipping the dialogue. It began to drone on as much as the gameplay, but at least it was largely skippable. 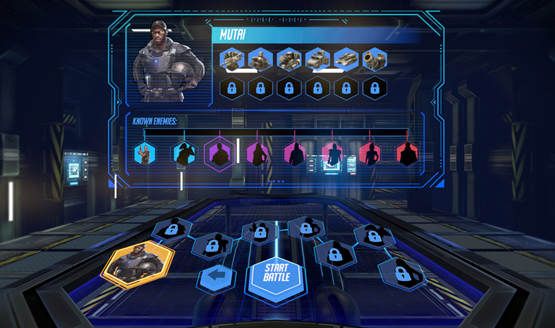 After the campaign there’s an arcade mode where you can use points earned in the campaign to buy unlocked units, and face off against a couch player using the social screen functionality. I had hoped this mode might be where some of that hidden strategy might be hiding, but I was wrong. For all my playing around with Arcade, it’s virtually the same dull troop spam gameplay as the campaign, which is already too long itself. VR experiences don’t need to be complex or lengthy, but the depth of League of War: VR Arena is virtually non-existent. It tries to espouse a sense of strategy, but the execution is so simplistic that it becomes all too easy to win (or sometimes lose) completely by accident by spamming the field with units. League of War is literally just a game of spawning units onto a bland tabletop battlefield. It’s designed well and the VR works, but more than a year on from the PSVR launch, a game needs to do something more than simply work to impress as a virtual reality experience. League of War VR Arena review code provided by publisher. Version 1.0 reviewed on a standard PS4 and PSVR. For more information on review scores, please read our Review Policy.